The NG for the kiss scenes of Shin Se Kyung and Lee Je Hoon, and Yoo Ah In and SNSD’s Kwon Yuri in SBS drama series “Fashion King” was made public on the SBS’s “Good Morning” broadcast on the morning of April 16th, 2012. The first kiss scene showcased in the NG in the kiss scene of Shin Se Kyung and Lee Je Hoon. In episode 7 aired on April 9th, 2012, the drunken Jung Jae Hyuk (Lee Je Hoon) suddenly kissed Lee Ga Young (Shin Se Kyung), and pushed her to bed. Originally Jae Hyuk supposedly to forcefully press Ga Young onto the bed, but maybe because of the shyness of first kiss, Ga Young fell into the bed herself, causing Lee Je Hoon and Shin Se Kyung to laugh, and the scene recorded its 1st NG. In the subsequent filming, the kiss scene suffered continuous NGs due to various reasons such as the hair of Shin Se Kyung covered the face and etc. On the same-day program also revealed the NG scenes of the Yoo Ah In and Kwon Yuri’s kiss scene. Kang Young Gul (Yoo Ah In) tried to forcefully kiss Choi Anna (Kwon Yuri), while Choi Anna slapped him on the face. 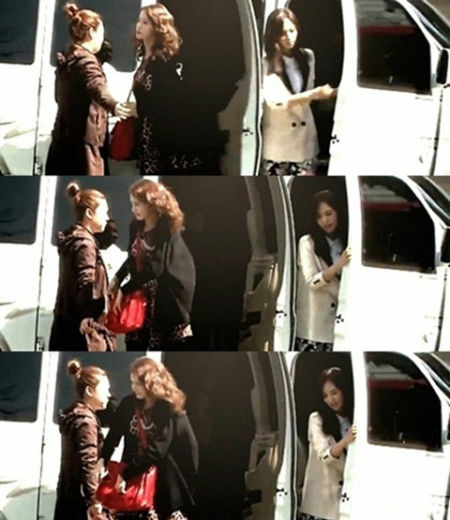 The scene was NG because of Yuri applied too much force on the slapping. Regardless of NG, the kiss scenes were shot successfully through the efforts of the actors, presenting visual feast to viewers.